A common use case is knowing how many times a function is called. It’s overly simplistic, but it clearly demonstrates what we’re doing. So let’s find out how many times sayHi is called. Since functions/methods are just values, we can create reference to the original method and overwrite it. // at the same time leaving sayHi to do whatever it does. We then call the function normally. From the perspective of the class, it is unaware of the spy and completely decoupled — which is super great. // > sayHi called 1 times. I wanted to learn the basics of require.js and pixi.js, so I thought it would be fun to create a small game to experiment with these libraries. I decided to make a clone of a game I used to play: Nibbles. It was a QBASIC game that I played on my 80386. Getting started with require.js was pretty daunting, there’s a bunch of documentation, but I found more of it confusing. Examples online helped some. Experimenting to see what worked and what didn’t helped me the most. On the other hand, pixi.js was very, very similar to Three.js….So much so, that I found myself guessing the API and I was for the most part right. It’s a fun 2D WebGL rending library that has a canvas fallback. It was overkill for what I was working on, but it was still a good learning experience. For some time I’ve wanted to understand how raycasting works. Raycasting is a graphics technique for rendering 3D scenes and it was used in old video games such as Wolfenstein 3D and Doom. I recently had some time to investigate and learn how this was done. I read up on a few resources, digested the information, and here is my understanding of it, paraphrased. The ideas here are not my own. The majority of the code are from the references listed at the bottom of this post. I wrote this primarily to test my own understanding of the techniques involved. Raycasting is not the same as Raytracing. Raycasting casts width number of rays into a scene and it is a 2D problem and it is non-recursive. Raytracing on the other hand casts width*height number of rays into a 3D scene. These rays bounce off several objects before calculating a final color. It is much more involved and it isn’t typically used for real-time applications. The idea is we are drawing a very simple 3D world by casting viewportWidth number of rays into a scene. These rays are based on the players position, direction, and field of view. Our scene is primitive, constructed by a 2D array populated with integers which will represent different colored cells/blocks while 0 will represent empty space. We iterate from the left side of the viewport to the right, creating a ray for every column of pixels. Once a ray hits the edge of a cell, we calculate its length. Based on how far away the edge is, we draw a shorter or longer single pixel vertical line centered in the viewport. This is how we will achieve foreshortening. Since our implementation does not involve any 3D geometry, this technique can be implemented on anything that supports a 2D context. This includes HTML5 canvas and even TI-83 devices. What really excites me about this method is that the complexity is not dependent on the number of objects in the level, but instead on the number of horizontal pixels in the viewport! Very cool!! Inside an empty OpenFrameworks template, you will have a ofApp.h header file. 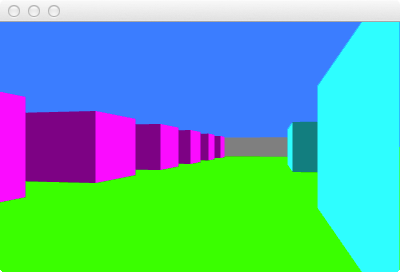 In this file we declare a few variables: pos, right, dir, FOV, and rot all define properties of our player. The width and height variables are aliases and worldMap defines our world. In the setup method of our ofApp.cpp implementation file we assign initial starting values to our player. The position is where the player will be relative to the top left of the array/world. We don’t assign the up and right vectors here since those are set in update() every frame. We need two crucial vectors, the player’s direction and right vector. In update(), we calculate these vectors based on the scalar rot value. (The keyboard will later drive the rot value, thus rotating the view). Once we have the direction, we can calculate the perpendicular vector using a perp operation. There is a method which performs this task for you, but I wanted to demonstrate how easy it is here. It just involves swapping the components and negating one. If our rot value is initially PI, it means we end up looking towards the left inside the world. Since our world is defined by an array it means our y goes positively downward in our world coordinate system. We can now start getting into our render method. To clear each frame we are going to draw 2 rectangles directly on top of the viewport. The top half of the viewport will be the sky and the bottom will be grass. The FOV determines the angle from which the rays shoot from the player’s position. The exact center ray will be our player’s direction. Perpendicular to this ray is a line which connects to the far left and far right rays. This all forms a little isosceles triangle. The apex being the player’s position. The base of the triangle is the camera line magnitude which we are trying to calculate. The purpose of getting this is that we need to know how far left and right the rays need to span. The greater the FOV, the wider the rays will span. Using some simple trigonometry, we can get this length. Note that we divide by two since we’ll be generating the rays in two parts, left side of the direction vector and the right side. Before we start the main render loop, we declare rayDir which will be re-used for each loop iteration. Each iteration of this loop will be responsible for rendering a single pixel vertical line in the viewport. From the far left side of the screen to the far right. For each vertical slice, we need to generate a ray casting out into the scene. We do this by mapping the screen coordinates [0 to width-1] to [-1 to 1]. 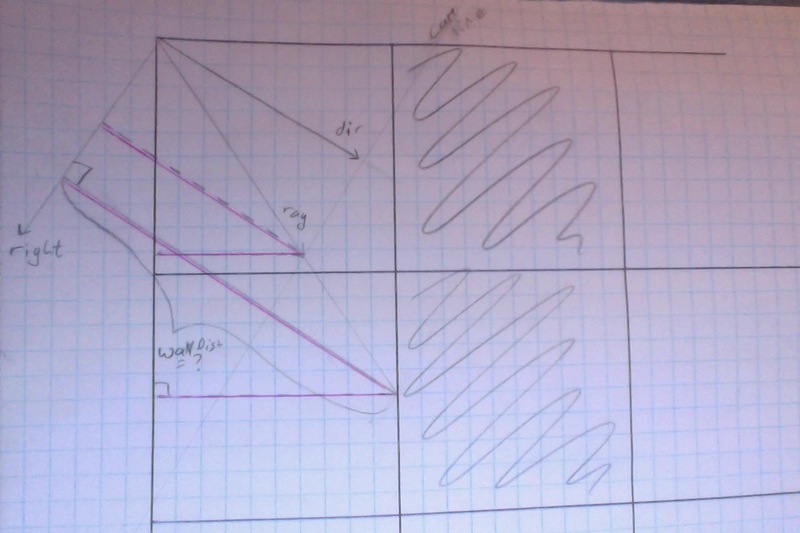 When x is 0, our ray cast for intersection tests will be collinear with our direction vector. currCamScale will drive the direction of the rays by taking the result of scaling the right vector. Here is where we generate our rays. Our right vector is scaled depending on the base of our triangle viewing area. Then we scale it again depending on which slice we are currently rendering. If x = 0, currCamScale maps to -1 which means we are generating the farthest left ray. Add the resultant vector to the direction vector and this will form our current ray shooting into our scene. Each ray travels inside a 2D world defined by an array populated with integers. Most of the values are 0 representing empty space. Anything else denotes a wall which is 1×1 unit in dimensions. The integers then help define the ‘cell’ edges. These edges will be used to help us perform intersection tests with the rays. 1. What is the magnitude from the players position traveling along the current ray to the nearest x edge (and y edge). Note I say magnitude because we will be working with SCALAR values. I got confused here trying to figure this part out because I kept thinking about vectors. 2. What is the magnitude from one x edge to the next x edge? (And y edge to the next y edge.) We aren’t trying to figure out the vertical/horizontal distance, that’s just a unit of 1. Instead, we need to calculate the hypotenuse of the triangle formed from the ray going from one edge to the other. Again, when calculating the magnitude for x, the horizontal base leg length of the triangle formed will be 1. And when calculating the magnitude for y, the vertical height of the triangle will be 1. Drawing this on paper helps. Once we have these values we can start running the DDA algorithm. Selecting the nearest x or y edge, testing if that edge has a filled block associated with it, and if not, incrementing some values. We’ll have two scalar values ‘racing’ one another. Okay, let’s answer the second question first. Based on the direction, what is the magnitude/hypotenuse length from one x edge to another? We know horizontally, the length is 1 unit. That means we need to scale our ray such that the x component will be 1. Then get the magnitude using the Pythagorean theorem. For this we have to calculate the length from the player’s position to the nearest x and y edges. To do this, we get the relative position from within the cell then use that as a scale for the magnitude between the edges. Here we keep track of which direction the ray is going by setting dirStepX which will be used to jump from cell to cell in the correct direction. For x, we have a triangle with a base horizontal length of 1 and some magnitude for its hypotenuse which we recently figured out. Now, based on the relative position of the user within a cell, how long is the hypotenuse of this triangle? This means we are 80% away from the closest x edge, thus we need 80% of the hypotenuse. The same method is used to calculate the starting position of the y edge. Here x and y values ‘race’. If one length is less than the other, we increase the shortest, increment 1 unit in that direction and check again. We end the loop as soon as we find a non-empty cell edge. Note, we keep track of not only the last cell we were working with, but also which edge (x or y) that we hit with sideHit. We kept track of the non-empty index we hit, so we can use this to index into the map and get the associated color for the cell. If all faces of the walls were a solid color, it would be difficult to determine edges and where the walls were in relation to each other. So to provide a very rudimentary form of lighting, any time the rays hit an x edge, we darken the current color. The farther the wall is from the player, the smaller the vertical slice needs to be on the screen. Keep in mind when viewing a wall/plane dead on, the length of the rays further out will be longer resulting in shorter ‘scanlines’. This isn’t desired since it will warp our representation of the world. Essentially, we take the base of the ‘lower’ triangle and divide it by the base of the ‘upper’ triangle. This value is actually the same proportionally as the perpendicular to camera line to the direction vector. If a ray was 1 unit from the wall, we draw a line that fills the entire length of the screen. To provide a proper FPS feel, we center the vertical lines in screen space along Y. The middle of the cells will be at eye height. To calculate how long the vertical line needs to be on the screen, we divide the viewport height by the distance from the wall. So if the wall was 1 unit from the player, it will fill up the entire vertical slide. At this point we need to center our line height in our viewport line. Draw two vertical lines down, the smaller one centered next to the larger one. To get the position of top of the smaller one relative to the larger one, you just have to divide both lines halfway horizontally then subtract from that the half that remained from the smaller line. This gives us the starting point for the line we have to draw. I’m still learning OpenFrameworks, so my implementation for keyboard control works, but it’s a hack. I’m too embarrassed to post the code until I resolve the issue I’m dealing with. In the mean time, I leave the task of updating position and rotation of the player up to the reader.